Rise Against Hunger: Inviting applications for ‘Empowering Communities Annual Program Statement (APS)’ to increase food security and incomes through agricultural and livelihoods programs by promoting improved agricultural techniques, business development skills, and market access. Funding brief: Rise Against Hunger partners with nonprofits around the world to provide food and other life-changing aid to those in need. These partners support a variety of development programs that work with members of the community to meet their basic needs and create long-term, sustainable change. Potential partnerships are evaluated by the level of need within the community, the sustainability of the organization’s program, its ability to import and manage in-country distribution of food assistance, as well as conduct monitoring and evaluation on the use and impact of Rise Against Hunger meals within their program. Rise Against Hunger (RAH) is driven by the vision of a world without hunger. The mission of the donor is to end hunger in our lifetime by providing food and life-changing aid to the world’s most vulnerable and by creating a global commitment to mobilize the necessary resources. RAH has a growing portfolio of programs aimed at eliminating chronic hunger and malnutrition around the world through sustainable community development that addresses the drivers of food insecurity. They are committed to the United Nations Sustainable Development Goal of ending hunger by 2030. Rise Against Hunger aims to increase food security and incomes through agricultural and livelihoods programs by promoting improved agricultural techniques, business development skills, and market access. This programming helps smallholder producers build resilience to the shocks and stresses of climate change by promoting climate smart ecological approaches to agriculture as well as diversification. The portfolio will seek to implement programming that increases food security through crop and livestock production (e.g., increasing gross margin yields), reduces post-harvest losses and creates value added products in the food security value chain. The portfolio will also focus on vertical and horizontal market linkages, market acceleration, and provide business development services utilizing push and pull marketing strategies. While production programming will likely target rural areas, post production and processing activities will be implemented in more urban and peri-urban settings, with a preference given to peri-urban settings when possible, to support the creation of more economically active communities where employment is available. RAH strongly encourages concept notes that consider cross-cutting themes such as nutrition-sensitive agriculture, gender, youth, partnerships, government integration, climate adaptation, and learning. Funding limit: RAH will provide funds via a cooperative agreement that will be cost-reimburseable. RAH anticipates that individual cooperative agreements will range between US$75,000 to US$100,000, with initial project length being a minimum of 9 months and a maximum of 18 months duration. However, on a case-by-case basis, applications that are below $75,000 or exceed $100,000 or 18 months in duration may be considered. Preference will be given to partners that conceptualize a multi-year ag/livelihoods program design, as RAH’s intends to fund multiple iterative cooperative agreements. Successful applicants must be operational and legally registered in the country/ies in which they are applying. Project duration: project length being a minimum of 9 months and a maximum of 18 months duration. ● Legally-organized associations of the above organizations. ● Are willing to sign applicable assurance certifications. ● Any Public International Organization (PIO). How to apply: All concept papers are to be submitted via e-mail to: empoweringcommunities@riseagainsthunger.org. Please include “RAH-EC-APS001” in the subject line. Any questions regarding this APS should be submitted to the above e-mail address, and questions will be answered two weeks prior to each closing date, as they are received, and will be disseminated to all interested organizations. Interested applicants should submit a concept paper written in English and not to exceed five pages (excluding the cover page, annexes, and certifications) typed, single-spaced, 1-inch margins, in a font and size not smaller than Times New Roman 11. Concept papers exceeding the five-page limit will not be reviewed. Microsoft Word or Adobe PDF formats are accepted. ● Funding information/Past Performance References. ● Copies of business registration in country/countries in which the project will be implemented.  Detailed budget notes and supporting justification of all proposed budget line items. VISIT US FOR THE UPDATED INFORMATION OF ((( 1250+ ))) NEW FUNDING OPPORTUNITIES IN 2017, , and BEYONDBY WORLD RENOWNED DONORS. THIS SITE HAS BEEN VIEWED BY ((( 71,450+ ))) VISITORS FROM MORE THAN ((( 172+ ))) COUNTRIES WITHIN JUST 20+ MONTHS SINCE ITS LAUNCH on 21st, FEBRUARY, 2017, INTERNATIONAL MOTHER LANGUAGE DAY!!! Our Facebook Page (““) is also started growing with 540+ ‘Like’ and 559+ ‘Followers’ ! *You can find All Posts in brief from . *You can reach us through or . Food insecurity can never be completely eradicated until natural resources are optimally utilised and included in the diets of most people, according to WSU Centre for Learning and Teaching Development senior institutional research associate, Dr Thozama Mandindi. Mandindi said that although it was good news that the rankings of South Africa’s food security shows improvement, there should be some assistance offered to other countries that are food insecure. She recently conducted a research study amongst indigenous communities living around the East London coast, namely Kidd’s beach, Khiwane and Kayser’s beach. “The study revealed that there’s no week that passes without the participants consuming seafood. This would be both seaweed and microalgae or some kind of fish from crayfish, crabs, shellfish or hake, these were ranked the most consumed in those areas sampled in the study,” said Mandindi. Coming from a home where both her parents were teachers, Mandindi said she grew up as an inquisitive person which led to her being interested in research. Mandindi’s research study has not yet been published, but she plans to publish a book that she is currently compiling based on the value of indigenous edible foods to contribute to the food security discourse. “Some communities live in famine, malnourishment and are overcome by affluence-diseases due to abandoning food that was part of their livelihood from time in memorial, food with more health benefits which are purported in the food pyramid, namely whole-grain and nuts, unprocessed vegetables and fruits, with unsaturated oils, less salt and sugar. Therefore, food security discourse should be around cultivating indigenous food in both rural and urban areas to ensure continued supply,” said Mandindi. Dr Mandindi hopes to successfully assist children from rural areas who lack self-confidence and who might not be adequately prepared for higher education. “It is applaudable that the rankings of South Africa’s food security show improvement, to number one on the African continent and three places to 44th out of 113 world countries. This does not make me satisfied and relax while our neighbouring countries live in famine, we as South Africans need to spread our wings to see where we can assist in food insecure areas,” she concluded. Amongst the number of qualifications backing her, is a Senior Secondary Teacher’s Diploma, a bachelor’s and Master’s degree in Nutrition and Food Technology. Nanotechnology is the interdisciplinary scientific approach leading to the development of nanomaterials. These nanomaterials have gained significant importance due to their positive impact for improving almost all the sectors including agriculture, health, pharmaceutics, cosmetics, energy, transportation and consumer products. Serious challenges have been raised for agricultural communities to meet enough food production according to demand of increasing population. Due to climate change and urbanization severe threats have been imposed to food security. More efficient technologies should be adopted to deal with this scenario. Nanotechnology has central position among various advancements in technology and allows manipulation and reconstruction of world at atomic and molecular level. It is interdisciplinary scientific approach leading to the development of nanomaterials. These engineered nanomaterials have gained significant importance due to their positive impact for improving almost all the sectors including agriculture, health, pharmaceutics, cosmetics, energy, transportation and consumer products. These nanomaterials can be effectively used to overcome the problems of depleting resources, climate change and shrinking landscape. The use of chemical fertilizers is not effective solution to overcome these constraints quickly. Nanomaterials have unique physicochemical properties as compare to the bulk materials. Their application leads to improved crop quality and quantity. Nanotechnology ensures the new and novel horizons for the nutrients delivery to the plants as porous domains can be developed on plant surface at nanoscale. Applications of nanotechnology are growing strong alliance between scientific communities and farming sector. There are three ways by which nanofertilizers can convey nutrients to crops and plants. The encapsulation of nutrients in the form of nanomaterials such as nanoporous materials or nanotubes. They may be coated along with protective thin film of polymers or may be applied as nanoparticles or nano-emulsions. Nanomaterials are having high surface area to volume ratio, so they are more reactive. They have more reaction sites so, increase in the reaction sites, enhances their movement towards plants and uptake is improved. Also the nanomaterials are in Brownian motion, which is the continuous state of motion, so their contact with soil and plant roots is enhanced leading towards the greater uptake and utilization for plant’s developmental processes. As compare to the bulk materials, nano materials are used in much less concentrations so the risk of environmental contamination is also reduced. Especially the use of nanofertilizers in degraded soils is of great significance. The bulk materials application under deteriorated conditions is not effective as major portion of that is not available to plants due to poor movement, chelation and fixation losses. When the quality of land is deteriorated, 25% of additional fertilizers should be applied which is economically not feasible. This problem can be easily sort out by the use of nanofertilizers. Nanomaterials are applied in small quantities, so the amount of toxic active ingredients can be reduced, nutrient losses after fertilization can be minimized and water and nutrient use efficiency can be enhanced on sustainable basis. Currently nano devices are being used for plant breeding and understanding of genetic transformations. Zeolite nanomaterials are playing an important role for agrochemical retention of water in the soil. Use of nano sensors is friendly approach leading to the better use of resources. Nanomaterials can also be used in the formulations of insecticides and insect repellents. Application of nano-herbicides is eco friendly and effective approach to eliminate the weeds. By the use of nanotechnology devices and mechanisms can be developed for the synchronization of control release of nutrients from the fertilizers according the need of the crop at growth stages. It is of great advantage as nutrients will be released according to demands along with the prevention for the conversion of fertilizers into those chemical and gaseous forms which could not be used by the plants. It will be beneficial approach to reduce the cost of fertilizer application. An example for the controlled release of nutrients is nanocomposites of zinc-aluminum layered double hydroxides. Development of devices and nanoscale films can increase the nutrient use efficiency and thus the crop production is ultimately increased. Photoreduction of nitrogen gas is possible to be reduced by the application of titanium dioxide in nano form. Additionally nano titanium dioxide acts as bactericidal additive. CuO, ZnO and Ag nanoparticles are more important for agriculture sector due to their significant roles in bio-modifications and bio-activities. Resistance against stress can be vigorously enhanced by the application of nano silica particles which forms the films at cell walls after being absorbed in plant roots. So the ability of plants to tolerate stress in enhanced. Precision farming techniques can also be improved by the use of nanotechnology. Regarding environmental perspectives, nanomaterials are equally important. It is possible to remove heavy metals and water borne pathogens by using carbon nanotubes fused mesh. Viruses, genetic materials, microbial endotoxins and small sized particles can be removed by the use of sophisticated filtering machines having nanotechnological improvements. Improvements in fertilizers products by the use of nanotechnology will exert profound effects on economy, energy and environment. Nanotechnology is being used for food production, food processing, packaging and distribution. The approaches for the use of nanomaterials in agriculture is promising but still the mechanisms for entry into plants and their accumulations in specific plant parts have not been identified and it is of much interest. Currently there is dire need to explore the new prospects for integration of nanotechnologies into fertilizers. Intensive research should be planned and conducted to avoid the risk of any danger to environment and human health due to use of nanomaterials. Worldwide secure and sustainable future for agriculture can be shaped by the use of nanotechnology as it has gained significant momentum to mitigate the biotic and abiotic stress and other constraints which are responsible for lowering the yields. Despite of the imminent benefits of applications of nanotechnology in agriculture, the innovative products are facing many difficulties for reaching the market and even few people are adopting it in field. Nanotechnology will be transformative into field if government and academics will give attention in collaborative manner. Strategically this collaboration between the industrial and scientific disciplines will reshape the commercial applications of nanotechnology for soil plant system. Innovation policies, regulations and research fundings are necessary to explore the further potential of nanotechnology for the development of agriculture and to enhance the food security. This article is jointly written by Tabinda Athar and Madiha Nisar. Mount Abu (Rajasthan): It is an innocuous-looking worm with four black spots near its tail and an inverted ‘Y’ mark on its head, no larger than a matchstick. But when Indian agricultural scientists spotted it in the maize farms of southern Karnataka mid-2018, they panicked. The fall armyworm is a native of the Americas. After making its way to Africa in 2016, it now appears to have found a home in India. The voracious pest, known to devastate a 1-acre field in a week, could endanger the agricultural output of not just India but the rest of Asia, particularly China, the world’s second largest producer of maize, if it migrates further east. 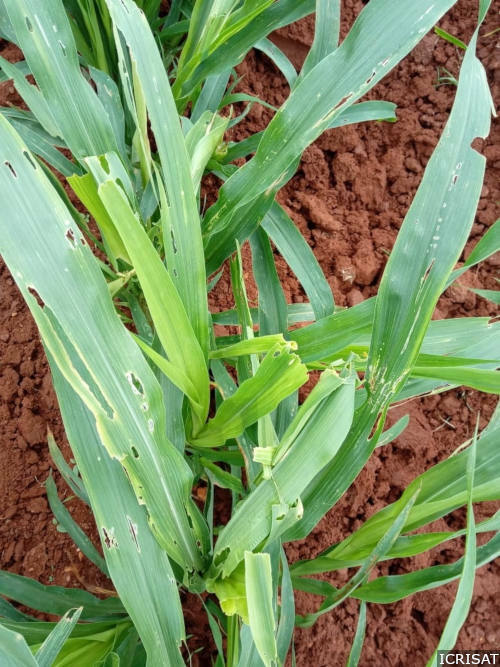 The scientists found the larvae of the fall armyworm feeding on maize in every one of the five southern Karnataka districts they surveyed–Chikkaballapur, Hassan, Davanagere, Shivamogga and Chitradurga. In some fields in Chikkaballapur, the pest had affected more than seven in 10 plants, which led to a nationwide pest alert. Since then, identifying and speedily implementing measures to curtail the spread of the Spodoptera frugiperda, the scientific name of the fall armyworm, has become priority for India’s agricultural scientists. The crops Jalali named–plus the area under oilseeds, another crop the insect preys on–occupy 82% of India’s farmland, as per the land use records of principal crops in the Agriculture Statistical Year Book 2017. This means it can inflict considerable damage on Indian agriculture if it is allowed to multiply. The fall armyworm’s widespread occurrence in Karnataka–where maize farmers reported losses in August 2018 (see news reports here and here)–was “likely to be soon followed by spreads to Tamil Nadu and Andhra Pradesh, major regions for hybrid maize seed production in India”: This was a prediction made by the International Institute of Tropical Agriculture (IITA), a not-for-profit generating agricultural innovations for Africa on August 4, 2018. “The fall armyworm has spread to states neighbouring Karnataka in barely one month,” Gopi Ramasamy, country director for India of the Centre for Agriculture and Bioscience International (CABI), told IndiaSpend. CABI is an international not-for-profit that provides scientific expertise to deal with agricultural and environmental problems. In Africa, the fall armyworm has invaded and cause heavy damages to a one-acre field in just a week. The current India invasion is of concern because the fall armyworm has an appetite for crops occupying 82% of the country’s farmland. If it crosses the border to other South Asian countries, the fall armyworm could “put the maize production of the whole Asian continent seriously at risk with dire economic consequences,” to quote the International Institute of Tropical Agriculture (IITA), a not-for-profit generating agricultural innovations for Africa. The IITA has also predicted that further expansion of the fall armyworm to Bangladesh, Nepal, Pakistan and other countries “will put the maize production of the whole Asian continent seriously at risk with dire economic consequences”. This spread is “highly likely” due to the “favourable climate” in Asia “with southeast Asia and south China most at risk”, said the Food and Agriculture Organization (FAO). A fall armyworm invasion in Asia “could have a devastating impact on Asia’s maize and rice producers–mostly small-scale farmers who depend on their crops for food and to make a living”, Kundhavi Kadiresan, FAO assistant director-general and regional representative for Asia and the Pacific, said in an interview to UN News. Samples of the larvae picked by Jalali and his colleagues from maize fields were subjected to DNA sequencing–a scientific test that establishes the order of the four chemical building blocks making up the DNA molecule. “Testing helped match the larvae with species found in Canada and in Costa Rica, essentially in the Americas, the fall armyworm’s native habitat,” Jalali said. So, how did the fall armyworm make its way to India all the way from the Americas? Until 2015, the fall armyworm was confined to its native habitat, mostly the tropical regions of the Americas, where it was known to prefer maize but also devoured rice, sorghum, millet, sugarcane, vegetable crops and cotton. In Brazil, the world’s third largest producer of maize, it is considered the most problematic pest to invade that crop. In early 2016, strains of the Spodoptera frugiperda were first seen in Nigeria, probably having crossed the Atlantic at Florida “as stowaways on commercial aircraft, either in cargo containers or airplane holds, before subsequent widespread dispersal by the wind”, estimated an October 2017 report by CABI, Fall Armyworm: Impacts and Implications for Africa. With the capacity to travel hundreds of kilometres in a day, the fall armyworm moth, the adult form of the larvae, made its way to 44 sub-Saharan countries–an area exceeding 22 million sq km, equivalent to the combined area of the European Union, Australia and the United States–where it demonstrated a growing appetite for other crops such as millet and sorghum, according to the FAO. “Our research colleagues in Africa have seen the fall armyworm invade and cause heavy damages to a field in just a week,” said Jaba. One view on how the pest made its way to India is that the it took the trade and travel route between Africa and Asia. “With the liberalisation of trade, the movement of foodstuffs has considerably increased and this raises the possibility of pests (including the fall armyworm) being carried to new destinations, even across oceans,” P K Chakrabarty, assistant director general, plant protection and biosafety, Indian Council of Agricultural Research, told IndiaSpend. Another view is that the monsoon weather system may have been carried the insect across the Indian Ocean. “The fact that the insect reached Karnataka at more or less the same time as the monsoon raises the possibility of monsoon winds having brought it over from Africa,” said Mamta Sharma, a theme leader of an Integrated Crop Management Research Program—Asia at ICRISAT. Once in India, the pest could naturally migrate to new parts in the country and to other parts of Asia over the land route, since it has strong flying abilities, said Ramasamy. Favourable weather conditions–a hot, humid climate and intermittent rainfall–have helped the fall armyworm’s quick spread in India, said Sharma. “The fall armyworm’s spread to Deccan India has more or less followed the northward movement of the monsoon,” Jaba said. The fall armyworm invasion is not the first time a pest from overseas has caused agricultural losses in India. In the five years to 2018, India has experienced two other instances of pest infestation, said Chakrabarty. Tuta absoluta, or the South American tomato moth–since the 1960s it has caused devastation in that continent–first appeared in tomato-growing districts in Maharashtra and Karnataka in 2014. It caused moderate to severe infestations. Then in 2016, coconut plantations in south India were affected by the rugose spiraling whitefly, an insect native to Central America. Could global warming be responsible for the acclimatisation of invasive pests to newer geographies? Insects are ectothermic, which means their caloric needs and metabolism depends on the external air temperature. When the climate warms, their metabolic rate accelerates which, in turn, makes them hungrier. Research has established that global warming will increase the overall pest population and create favourable habitats for them in temperate regions that were earlier too cool for their spread. Scientists at the University of Washington recently modelled the potential losses of staple crops to higher insect activity from global warming. Corn, rice and wheat alone are staples for about 4 billion people worldwide and account for about two-thirds of the food energy intake. Each degree Celsius rise of the global mean surface temperature will increase the worldwide losses of these three staples by 10-25%, according to a new study published in the journal Science. Increases in insect activity from a 2-degree Celsius rise in surface temperatures would shave off 31% of the corn and rice crops and 46% of the wheat crop. “It appears that under virtually all climate change scenarios, pest populations will be the winners, particularly in highly productive temperate regions, causing real food prices to rise and food-insecure families to suffer,” said co-author Rosamond Naylor, a professor in the Department of Earth System Science at Stanford University and founding director of the Center on Food Security and the Environment, when the study was published. Globally, about one-fourth of crops are routinely lost to insect pests, pathogens and weeds. India loses roughly 20% of the various crops it produces annually to biotic stresses including insects, pathogens, weeds, rodents, higher vertebrates and so on, said Chakrabarty. The farm sector is estimated to lose crops worth Rs 90,000 crore annually to pests, weeds and insects, according to this report published in The Hindu. Farmers need to prepare for rising insect pressure to mitigate the impact on the already fragile global food supply, scientists estimate. India had successfully managed to control the pest invasion of coconut plantations and tomato crops, said Chakrabarty. But the fall armyworm is a formidable pest. Mozambique lost 50% to 60% of its maize crop to this pest and Malawi 10%. Overall, the damage has been pegged at over $13 billion, prompting the FAO to invest $9 million in managing the invasion. In 2017, CABI predicted that if the fall armyworm spread was not controlled in Africa, the pest could wipe out between 21% and 53% of the annual production of maize, averaged over a three-year period, in 12 maize-producing countries of the continent. How is India responding to the present outbreak? “Biopesticides and biological control agents are at the forefront of our efforts to manage the ongoing fall armyworm infestation,” said Chakrabarty. Regular pesticides are popular but the FAO has warned against “the heavy use of pesticides, which can be harmful for people, their environment and in the longer run”. Instead, it recommends “the use of biopesticides, including those based on bacteria, virus, and fungus, which have been tested, developed, registered and used successfully in the Americas, where the pest has its origin”. One of the ways to control the population of the fall armyworm is to eliminate the egg mass of the pest from the leaves of affected plants. Farmers are being advised to manually crush egg masses containing a cluster of 150-200 eggs. This photograph shows the egg mass on the finger millet crop. In India, the Central Insecticide Board and Registration Committee (CIBRC) has declared that botanical pesticides based on neem, pyrethrum and cymbopogon have been found effective against the fall armyworm. But where the infestation is severe, the use of chemical pesticides is also being encouraged, as per ICAR. However, biological control is a natural approach involving the field release of predators of the invading pests. This is considered essential and effective because migrant pests do not have natural enemies to check their spread in new habitats. 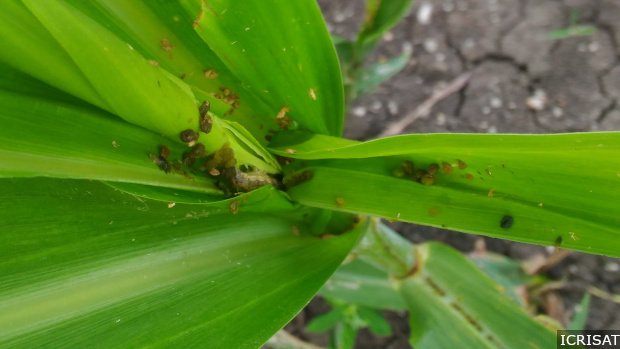 “We have recommended the use of biological control agents like entomopathogenic nematodes, entomophagous fungi like Beauvaria bassiana and Metarhizium anisopliae for larval control, in maize cultivation,” said Chakrabarty. Other methods include inoculating unaffected crops, baiting the larvae and eliminating the eggs from affected plants. ICRISAT is using (and proposes the use of) recommended insecticides and traps based on pheromones, chemicals that attract living organisms, to capture the adult male moths in huge numbers, thus helping to control the pest population.